Many lovers prefer to celebrate a weddingin summer. Nature pleases a variety of colors, gives the opportunity to celebrate this event is not in the restaurant and outdoors. Another advantage of the wedding at this time is the ability to create even the most unusual summer bouquet. Many flowers blooming in summer, give a flight of fancy florist, inspiration to create a beautiful masterpiece. Wedding Day - the most exciting,crucial moment for the girl. To it focused a lot of attention: to her outfit, hair and, of course, flowers. Large, elegant floral composition - is not a guarantee of success. It is important that the elements combined together. Bouquet of the bride should approach her, not only in taste, it should blend well with the image of a wedding, fit tsvetotipu girl. So for women with light skin and hairwell suited light, delicate flowers, and in the hands of dark brunettes better will look more vivid compositions. At the same time, they must comply with the wedding style. For example, a beach wedding will be very appropriate orchids and lilies, for a celebration on the meadow or in the garden suitable wild flowers, as well as composition with the addition of fruits, berries and vegetables. At the wedding of the village or eco-style bouquets look great with details wheat ears. Red is the first in the list. Roses symbolize love this color - the deeper the color, the deeper feelings are considered young. Pink shades speak of tenderness. 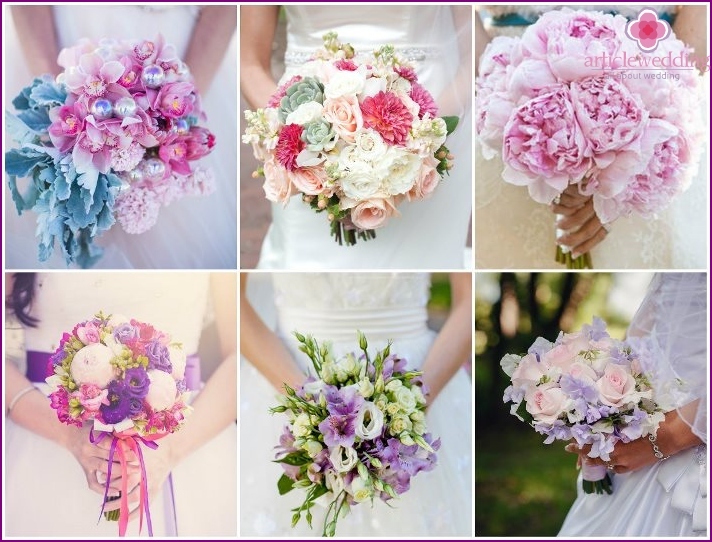 Flowers such tones will give the image of the bride's elegance will add romance to the holiday atmosphere. Purple will give a mystique, mystery .. Bright colors - a classic choice. They are a symbol of purity, innocence, honesty. White buds may merge with the dress. To avoid this from happening, the bouquet should be 2 shades darker than the dress of the bride. However, if the bride chose the white colors, it is better to dilute the variegated greens. Along with shades, which are ideally suited forbridal bouquet and emphasize the solemnity of the moment, there are colors from which florists are advised to give up. Some European countries yellow is considered a sign of jealousy, infidelity, so it's best to give it up, even though the composition will look sunny and positive. It is not necessary to add maroon, dark blue and black colors. Regardless of the advice of others andflorists, choosing colors should the bride, starting from their desires, taste preferences. If you keep the unloved bouquet of flowers on the wedding day just because it is made or someone they love, the value of the composition loses all meaning. This composition does not give happiness to young, no matter what the characters did not hide himself. The bride must remain true to themselves and their preferences. Warm weather and sunshine pleases eyes richespaints, it is a great time to create the most unusual bride's bouquet. Lots of flowers, herbs, berries, fruits, of which you dreamed of in cold weather, are available. To create an elegant wedding bouquet just need the desire and fantasy, everything else is already at hand - Given the nature. The highlight of the season is a compositionthe ability to create a mood, convey the atmosphere of the time of year. 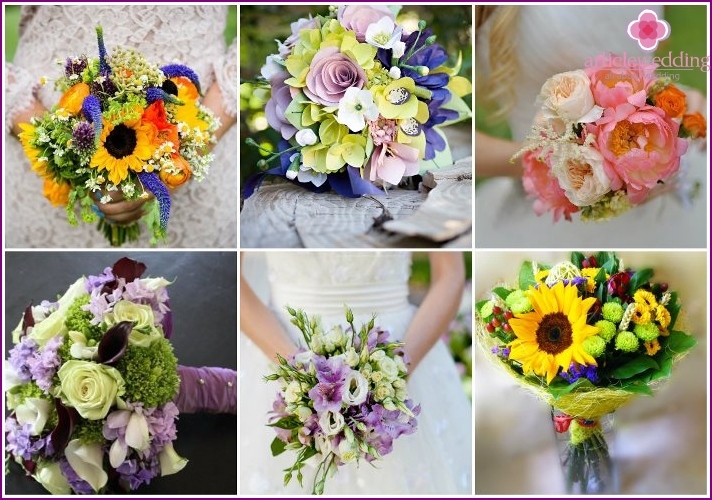 Make a summer wedding bouquet will help to correct color, color and decoration. For such compositions is very important color. By creating a summer bouquet, choose a rich and pure tone may slightly dilute their pastel shades. 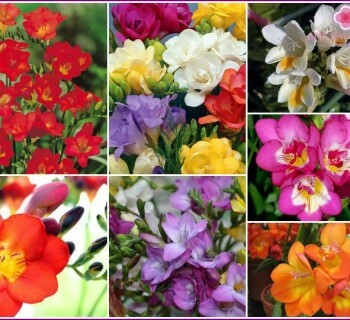 Flowers fit almost all, you onlyAvoid plants that bloom in early spring or late fall. To emphasize the mood of help elements that symbolize summer. It may be small florets of a sunflower, mini gerbera, daisy, speedwell, Alstroemeria, rose, peony. These bright bouquets suit brides who are used to always be the center of attention. Bride said the most beautiful wildflowers. The image of the girl and a modest style of celebration. 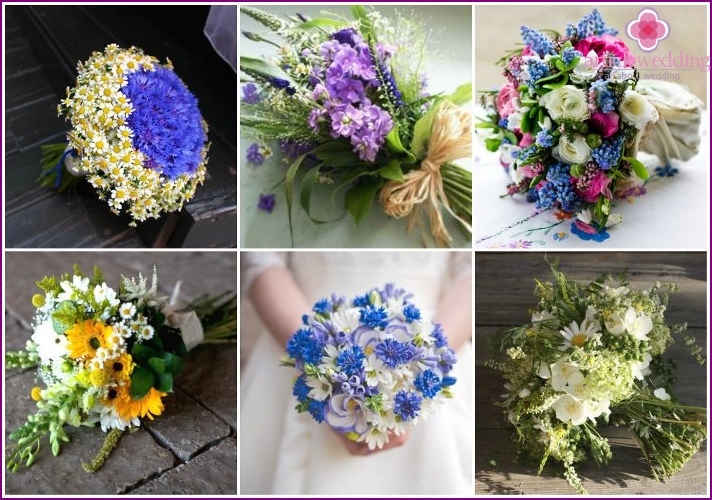 The bride is well aware of what wildflowers will be perfect for a wedding bouquet. There is time, the ability to create a composition in the wedding day. Maki. It looks impressive, but perishable, so it is recommended to cut them in the morning of the wedding day. Daisies. These flowers look simply and innocently, but their modesty mesmerizing. Chamomile bouquet looks very festive. Cornflowers. See sought, even if simply drag strip. Bright inflorescence dressing perfectly complement the tenderness and beauty of the girl. Cornflowers since ancient times are famous for the healing properties, the ability to scare away evil spirits. Daisies. To convey the atmosphere of femininity, romance. Summer time is also good that the bouquetthe bride may contain not only the flowers and greenery. Originality will make berries, fruit. Such compositions are distinguished by their exclusivity, appetizing juiciness. To create a suitable mature and green fruits. 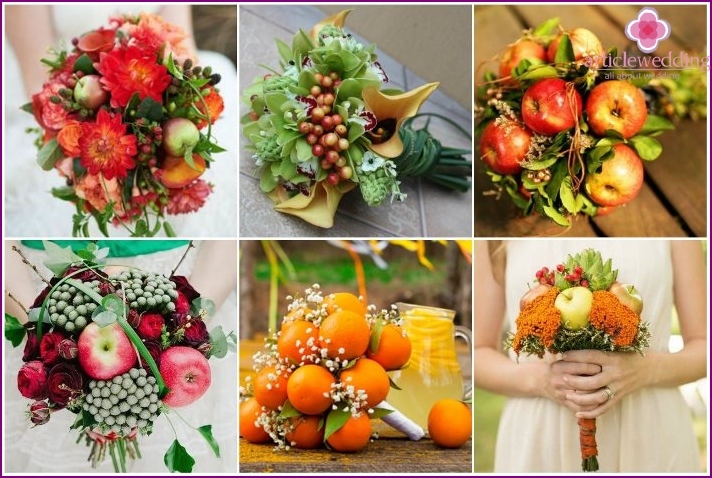 Nature gives us a lot of fruits and berries, which are easy to use in a bouquet the bride: raspberries, strawberries, currants, rosehips, blackberries. 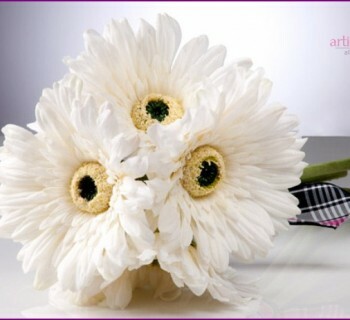 The main thing - do not overdo it and do not overshadow the beauty of the bouquet of flowers. bouquet decor - not the last question atcreation. It largely depends on how well will look like flowers. Elegant and sophisticated look will add feathers, precious stones and pearls. But such expensive jewelry summer bride's bouquet is not each pair by force. Replace them no less beautiful and elegant decorative elements: sequins, beads, lace, ribbons, bows. During a trip in a limousine, put flowers in a niche for cooling champagne, it will help them to hold out longer. If possible, keep the composition more in the shade than in the sun. Avoid drafts. Bunch should be harvested in the floral sponge soaked in water. Periodically put flowers in a vase with water. Do not leave the song next to the objects that provoke the withering of flowers. 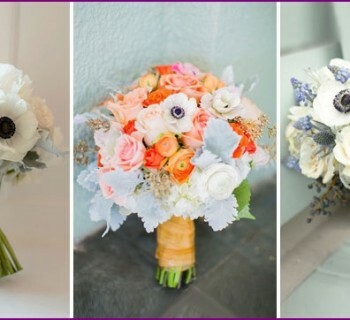 A truly stunning looks thatbouquet that the bride has created with his own hands. It harmoniously blends into its image. The bride knows best, what colors will suit most. Many women abandon this idea, believing that to create such a difficult track. In the video below an experienced florist is available to tell how to make a bridal bouquet of roses and hydrangeas, so it was appropriate shape, size, and do not break down. Summer bouquet full of its colors, enlivenatmosphere, pleasing to the eye. Bright compositions carry the energy of happiness, warmth and joy. This riot of colors importantly - do not get confused and find the combination of colors and shades, which will be suitable for the particular celebrations and the bride image. But do not forget about the groom. Sometimes a bunch associated with them, with an emphasis on items of clothing (eg tie or bow tie).